Many sacrifies have been done by many man and women in freedom fighting. The forth coming generation would get inspiration from them. 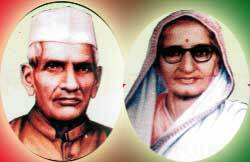 There wer some couples who participated in freedom fight in step by step and get enclosed their lives in creative work of Mahatma Gandhi. One of the couple were Pandit Om Parkash Trikha and Smt. Laxmi Devi Trikha. They dedicated their whole lives in service on the path of humanity. Pandit Om Parkash Trikha was native of Punjab. They were code loaded by national sentiments. He left his govt. Job and started working for congress on land near border. He started from Khadi & Village Industries. He got sticks against Simon Commission and did prison tour. When letter of Gandhi Ji “Harijan” was published in Urdu language he was editor. He was a kind hearted poet and good litterateur. He more than 23 books concern with Gandhi Ji views adn published them. In the “Bhudan Andoloan” of Saint Vinoba Bhave in Punjab & Himachal Prades, me made arrangement of travelling and were with in front of travelling. The life of Pandit Ji was very simple, easy and high thinking. He was also a good spokesman. By getting inspiration from life of Pandit Ji many workers are also too aheading in social service. After the death of Nation Father Mahatma Gandh too much money in millions was deposited on the name of “Gandhi Smarak Nidhi”. On those days the President of India Dr. Rajender Parsad was the Chairman of “Gandhi Smarak Nidhi”. When question was arised for the appointment of Incharge for Punjab state's Gandhi Smarak Nidhi then Pandit Ji's name was presented by Dr. Gopichand Bhargav 1st Chief Minister of Punjab state. On the special request of Sardar Patel you took the charge of institution. When there was a large area of service before you. You took the benefit of last experience of service work and provide new motion to institution. Initialy the office of Nidhi was in Ambala but Pandit Ji wanted that this work to be concentrated from village. After searching many places, he found a plance on G.T. Raod in Panipat District “Pattikalyana” village. Where land was barren and desert of “heap of sand”. After very hard work the Chief office of Gandhi Smarak Nidhi Punjab, Haryana & Himachal Pradesh was setteled in that area. Here many training camps were settled to provide training to workers. For the publication of Sat Sahitya of Gandhi Vinoba Sarvodaya and others, many libraries were opened which are running efficiently these days. Under the publication of Village Sentiment a monthly magazine was used to publish many years. Like Pandit Om Parkash Trikha the life of his spouse Smt. Laxmi Devi Trikha was full of sacrifice and service. She went to Jail many times during freedom fight. In 1944 she got a chance to live in Sevagram Ashram for one month near Gandhi Ji. At there she took the charge of cleaning work. On seeing her cleaniness Gandhi Ji called her and asked where she learnt. Gandhi Ji were pleased by knowing her experiences of Gandhi Ashram Sahadra. The nature of Laxmi Devi was very soft and used to speak very sweet. All of workers called her Mata Ji by love. Once police came to arrest Laxmi Devi, While doing pikketing of cloths, then she replied that only lady police can arrest her and those days lady police were ver few. On this subject whole city was with her. But when she come to know that the riots can be started. Then she ready to go police station. But have to make arrangement for lady police in police station. British Govt. Have to agree on that subject and called lady police from outside and posted with her. Trikha couple had no child of their own. They look whole ashram as their own family and were in the up and down of every ashram resident's. Pandit Om Parkash Trikha Ji died on 10 Nov. 1984 and Smt. Laxmi Devi Trikha Ji died after that. Every year in Swadhyay Ashram, Pattikalyana 10th November is celebrated as death Anniversry of Pandit Om Parkash Trikha Ji and remembrance day of Mother Laxmi Devi Trikha Ji.